Bad Marie [Book Review] – my books. my life. Marie spent the last 6 years of her life in jail. Newly released, she finds a job as a nanny to, Caitlin, the daughter of her oldest childhood friend, Ellen. But Marie is after more than just a job; she has her eyes set on Ellen’s husband, the author of her favorite novel, Virginie at Sea. What follows is a series of decisions that takes Marie and Caitlin on a whirlwind journey around the globe as Marie finds her way through this post-prison world. I spent a cozy Friday evening with Bad Marie. I picked it up, started reading, and found myself devouring the entire thing in a few hours. I think this alone means that it deserves that much dreaded word: compelling. I was fascinated with Marie and the way her character developed throughout the novel. At first, she appears to care only about the moment and about herself. But as the story progresses, we see that there is certainly more to Marie. The juxtaposition of Marie’s bad decisions and the ever-present Caitlin made the novel so intriguing. No matter what Marie does, she has to make sure Caitlin is fed, rested, and safe. Caitlin has complete faith in Marie, even when Marie has no idea what’s coming next. This book is getting a lot of buzz around the blogosphere and it is all well-deserved. 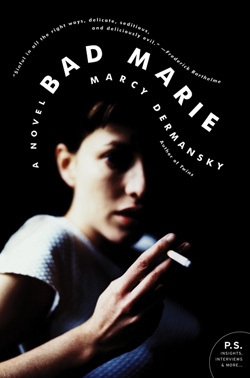 Dermansky has given us a captivating novel about a character in a situation most of us are unable to relate to making choices we probably would not make. Yet I promise you will be rooting for her by the end. Go pick up a copy and get comfortable because you won’t be able to put it down. I love books that are so intriguing that keep us involved in the novel for a whole evening! 🙂 Glad you enjoyed it, it sounds like a good read! I’m sort of kicking myself for not reviewing this one. It sounds great! I may have to check it out one of these days. I’m so glad you enjoyed this, I totally agree with your review. Great choice for review — Marcy’s work deserves this kind of consideration. I’m so glad you liked this one. I hope you link your review up to the Harper Perennial database here.